We start with a disclaimer: I live in a country that has a lot of castles and I have visited some of them. It’s a physical impossibility to not like a good castle. Big old, in a moat, not in a moat, on a hill, on a cliff, they have it all. Castles tick all the boxes. But, I am no expert. These books from Haynes have added to my knowledge. One tells us how to build and operate one while the other describes how to smash your way in. There is ruined castle not far from my desk. Hadleigh Castle was built some time after 1215 during the reign of Henry III and was a venue for some of the shenanigans between Edward III and Queen Isabella a century later. The site was pretty much defunct within a couple of hundred years and the ruin was gradually stripped of material used to build local churches etc, thus proving recycling is not a new concept. The great John Constable made drawings and paintings of the ruin in 1814 as the remnants continued to crumble. You might have caught a glimpse of it had you watched TV coverage of the mountain bike competitions at the 2012 London Olympics. First things first we have to build our castle. In The Medieval Castle – Design – Construction – Daily Life, author Charles Phillips has the benefit of access to the remarkable project under way in France where a castle at Guédelon is being built using traditional techniques. The project has been the subject of BBC television series that I have seen some of. It has been a fascinating show where the viewer is bound to take a strong dose of vicarious pride in the skills of the masons, carpenters and engineers doing the actual work. Twenty-years on and the castle is not yet complete, but the immense amount of detail shown in Mr Phillips’ book is a testament to their achievements. We also get to look at a number of castles in Britain where the author takes us through key features and the developments in construction that mark the differences to them. Castles are, of course, built for an outwardly simple purpose but have to fit into very different landscapes in a country like the UK and this leads to an array of decisions of how to achieve the central aim efficiently. These details are fascinating. Ok, we’ve built the sucker, now lets have someone knock it down. In Siege Warfare Dr Chris McNab looks at the methods of breaking down defences from before the Romans until the gunpowder age. There is so much to enjoy here and, once again, the explanations of the weaponry and tactics are utterly beguiling. You can use the likes of Kingdom of Heaven, Gladiator, The Borgias or even bits of Game of Thrones and Assassin’s Creed as a visual reference, but the information provided here goes much deeper (of course) and it is all deeply satisfying. I was pleased to see a snap of the trebuchet I saw at Castelnaud in France making an appearance. 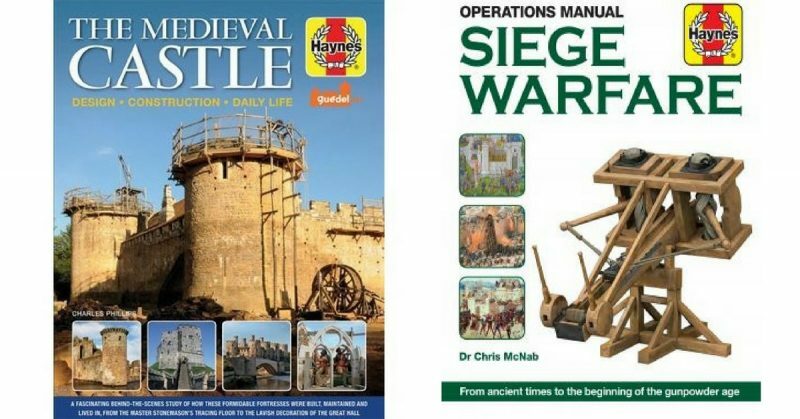 The author takes us from early weapons through to siege engines and towers and looks at sapping and mining and many other ways of bringing the house down. The book serves to prove that however clever and resolute the construction, just as much thought will go undoing all that effort. It would be convenient to place great importance on gunpowder and it cannot be underestimated, but its fair to remember just what besieging armies achieved before that particular big bang. I’m tempted to ask for a book bringing the history up to date, but you can get much of that for yourselves reading of Verdun in 1916 or the Belgian forts in 1914 and 1940. On their own these books are special, but as a pair they are fantastic. I salute Haynes for looking beyond modern weaponry to take in these subjects. These books make for a perfect chill out experience combined with a beverage of your choice. I am writing this on a chilly and rainy Easter afternoon when going out does not represent much of a prospect. Pull up a quiet zone, fix your drink and relax. Absolutely brilliant!